Nubra Valley is about 150 km north of Leh, the capital town of Ladakh, India. 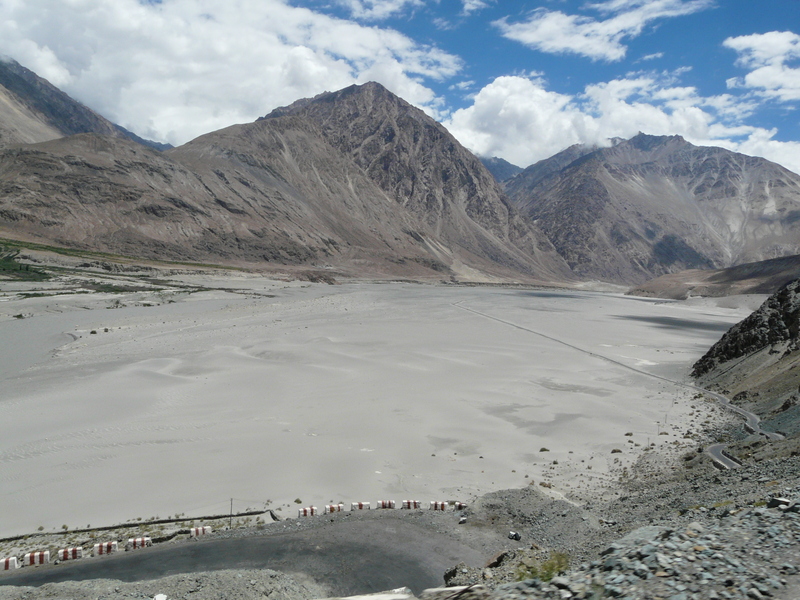 This is where Shyok River meets the Nubra or Siachan River to form a large valley that separates the Ladakh and the Karakoram Ranges. We were exited to go to that place. 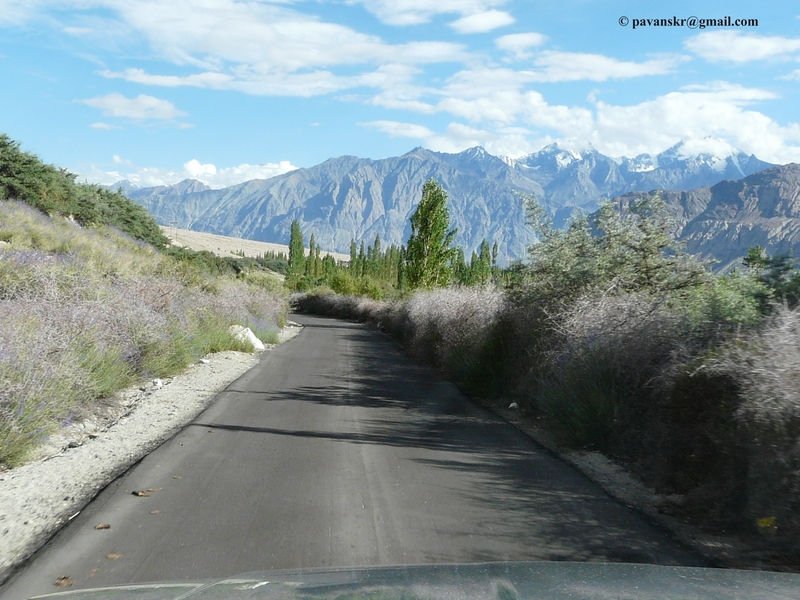 We left Army camp at Leh by 7AM and proceeded towards Nubra valley. We met the first check post at South Pullu. 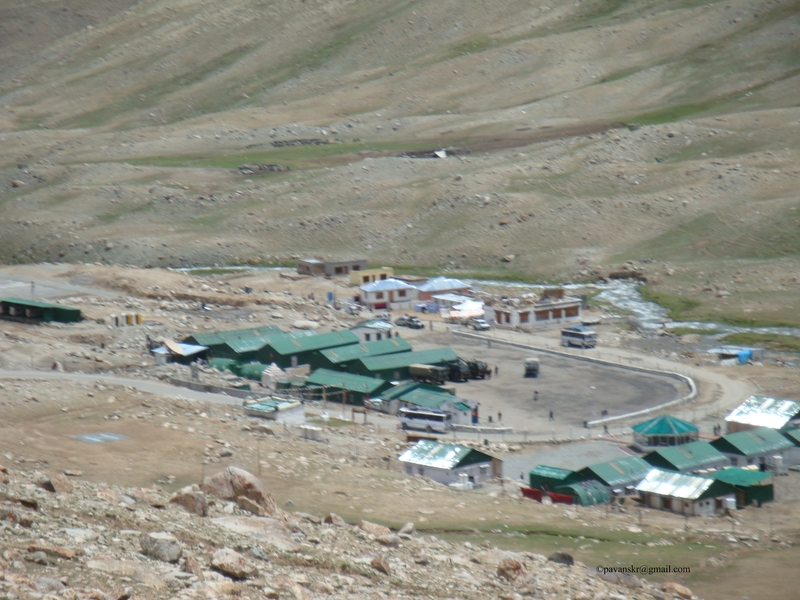 There were two check posts – One from the District police and the other from the Indian Army. The police did not allow us to pass the check post even after telling it is an army vehicle. They needed written permission from the army as per the direct orders from SP. We called up captain Upul and instructions walked up to the army check post where he called on the secure line and authenticated our permission. It was nice to be inside the army bunker sitting beside a heater and watching the working of capacitor charged phone like secure equipment. 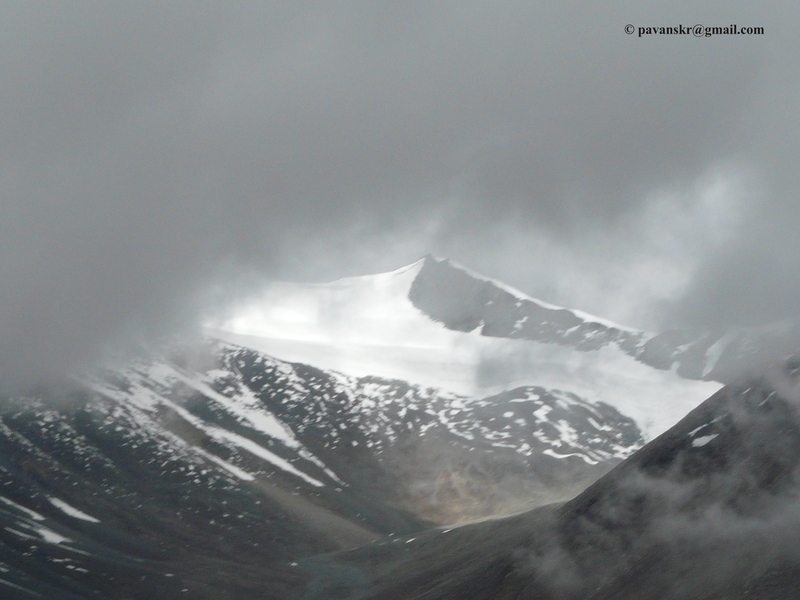 After passing the check post and an hour’s drive, we reached Kardung La – The highest motorable road on the planet. 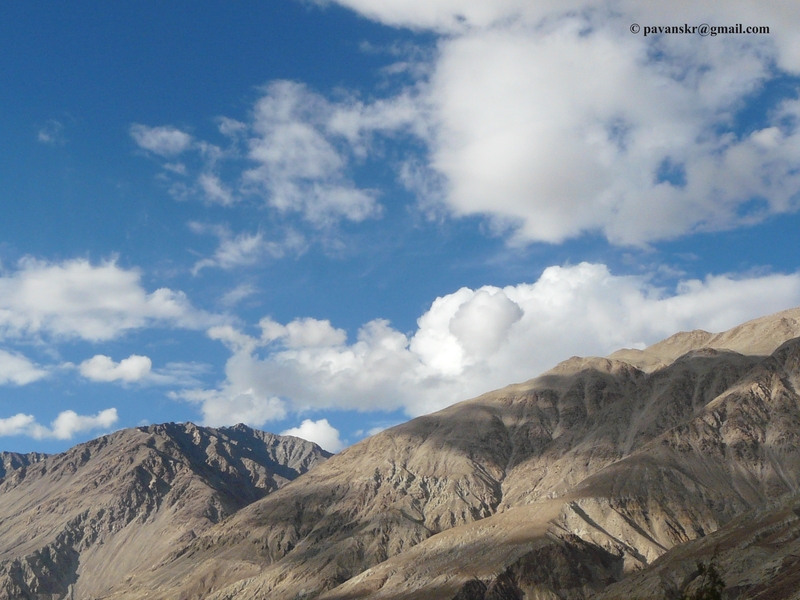 Just before this place we pass through a gateway like rock called Gateway to Nubra. It was freezing cold there and clouds passing over even threw a few hailstones at us. There were a few Bike enthusiasts who were congratulating themselves upon their successful voyage to the so called ‘Biker’s Mecca’. This place is secured by the army and there is a communication tower too. 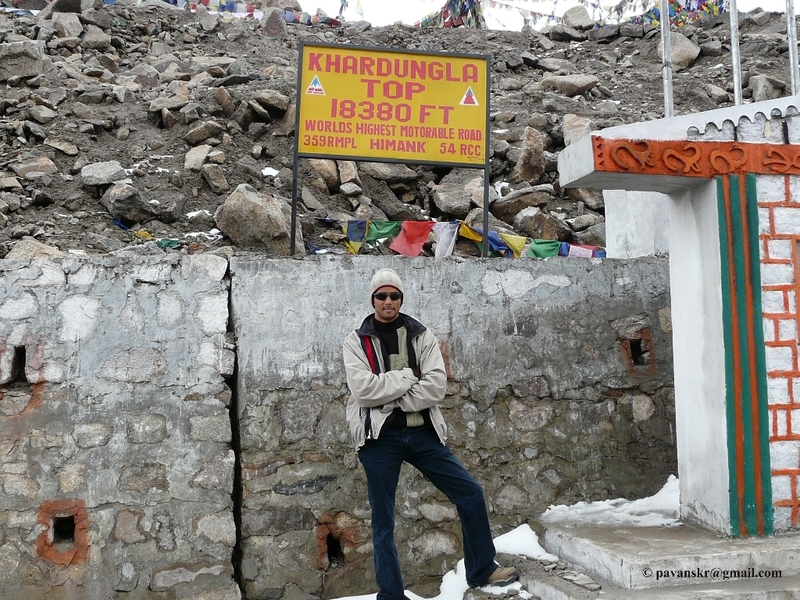 No one can leave this place without his/her photo in front of the stone slab that declares its altitude – 18340 ft! 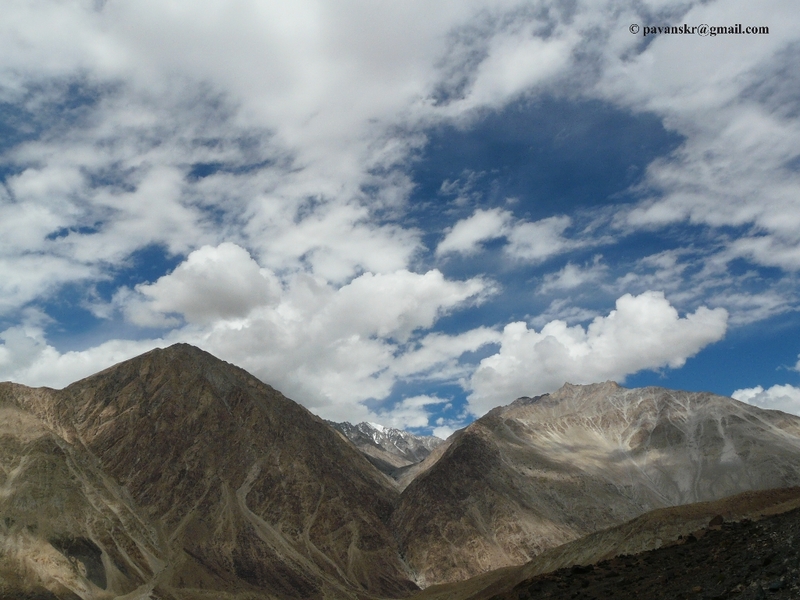 The descent to great valley of Nubra starts soon after passing the kardung la. 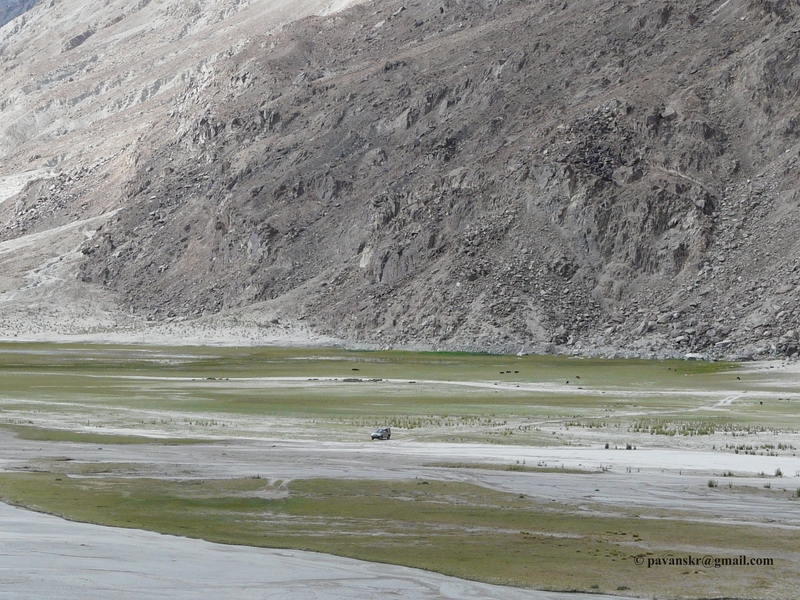 The Nubra Valley had blown the beauty of my previous sights right out of the water. All the adjectives in the dictionary cannot do justice, and my attempts to capture the tiniest bit of its essence on camera have so far proved futile. I can only suggest you come and see for yourself. We passed through small streams flowing across the road. All along the road there were cheesy saftey slogans like “If married, divorce speed”, “If you sleep, your family will weep”, “Be gentle on my curves”, “Feel the curves but don’t hug them”, “Check your nerve on my curve”, “Mountains are pleasure if you drive with leisure”,”It’s not a rally, enjoy the valley” and my favourite, “Love thy neighbour but not while driving”! 🙂 . We passed through another check post at North Pullu – Infact they were waiting for an army vehicle with us to pass the point. The garden like Kardung village is 45 minute drive from North Pullu. We stopped at a small hotel – the only hotel – for some tea and snacks. Two of my friends fell sick and threw up because of altitude. After an hour’s drive we reached the Nubra desert. It is a desert located in the middle of mammoth mountains. The road forks here. One road leads to Diskit and hunder and another straight road bisects the white desert and continues towards Panamik. We took the panamik road and stopped in the middle of the desert to enjoy the view around and take a few snaps. The road to panamik passes through wonderful gardens of Sumer village. 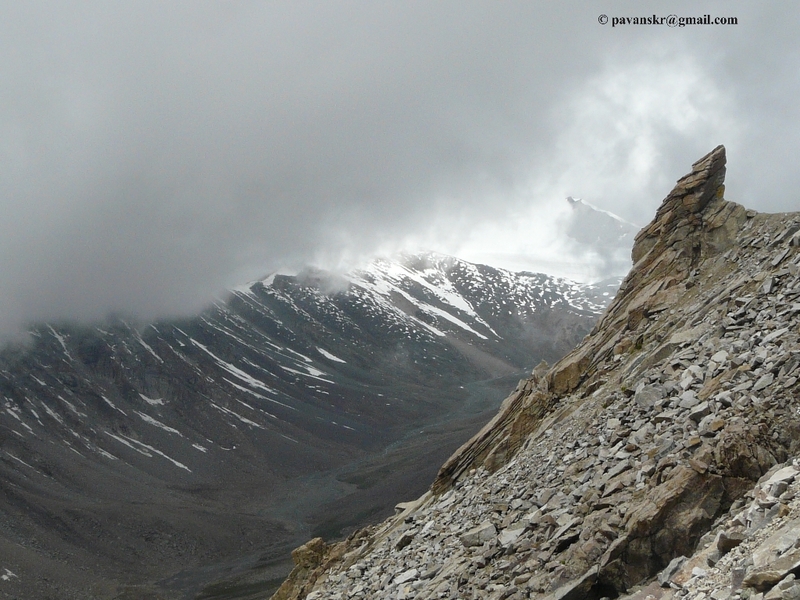 Panamik is located just 40kms from Siachen base camp and is famous for its hot sulphur springs. It is not that good a tourist place since the springs were no good compared to the ones at Manikaran. On our way back we stopped at a place 8km from Sumer and began our trek. 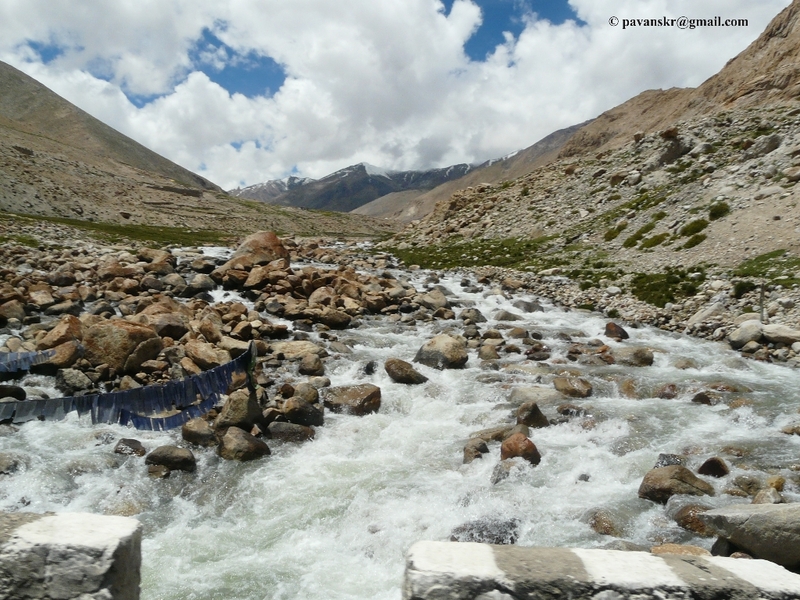 We crossed the Siachan riverbed – we had great time and fun crossing that river – and saw a hill standing in between us and our destiny – the green lake. After trekking filled with numerous breaks we reached the lake, of course took some photos, rested for a while and returned via the same route back to our car.